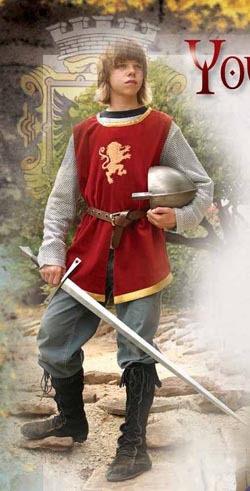 Whether a young Sir Lancelot or a storybook prince, any young man will be a heroic champion in this knightly tunic. The rich red cotton velvet is trimmed in gold and has a gold rampant lion fully embroidered on the front. In addition, an artificial silver shirt of mail, made of lightweight rayon mesh, will enable your young knight to look his dashing best. Dry clean. One size.